Root Letter Pen Pal Edition (P-Qube – PS Vita/PS4) – Rice Digital Exclusive – 3WIREL! 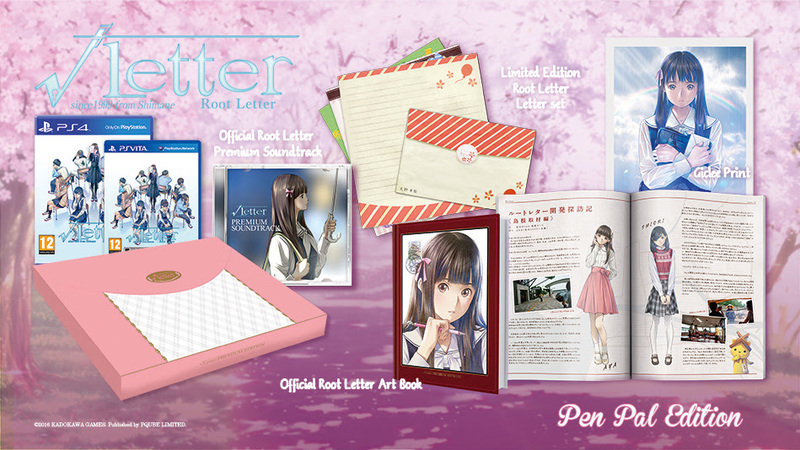 This special edition of the upcoming title Root Letter is exclusive to Rice Digital! Rice Digital is proud to announce that we will be carrying the EXCLUSIVE special edition to PQube and Kadokawa Games’ forthcoming Visual Novel, √Letter. Root Letter is one of this year’s most anticipated Visual Novel titles. To celebrate this beautiful work from Kadokawa Games, we will be releasing the Pen Pal Edition to fans in both Europe and North America. – Standard version of Root Letter on PlayStation 4 or PlayStation Vita. – Premium Artbook as released in Japan, but fully localised into English. – Stunning, high-quality, Minoboshi Taro Giclée Print on Hahnemuhle paper. – Fumino Aya Handbag presentation box.